Businessman (1863–1914) and the founder of Sears, Roebuck and Company with his partner Alvah C. Roebuck. Essentially nonexistent DS, signed “R. W. Sears,” one page, 8 x 13, 1901. 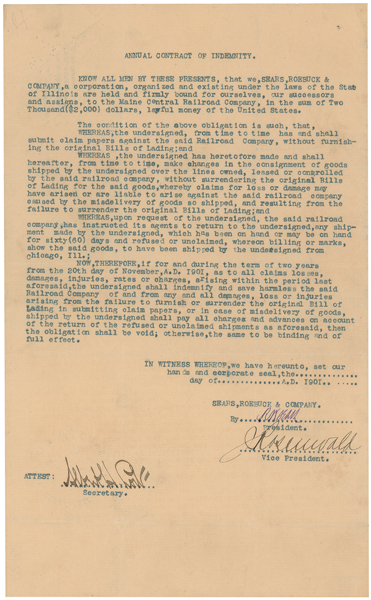 An annual contract of indemnity, which reads in full: “Know all men by these presents, that we, Sears, Roebuck & Company, a corporation, organized and existing under the laws of Illinois are held and firmly bound for ourselves, our successors and assigns to the Maine Central Railroad Company, in the sum of Two Thousand ($2,000) dollars, lawful money of the United States. Signed at the conclusion in purple ink by Sears, and also signed by part owner and company vice president, Julius Rosenwald. With Rosenwald as VP and Treasurer, the company’s annual sales climbed from $750,000 to upwards of $50 million. When Sears resigned the presidency in 1908, Rosenwald was named president and remained as such until 1924, when he resigned to focus on philanthropic efforts. In very good to fine condition, with intersecting folds, staple holes to top left corner, a few scattered creases, a uniform shade of overall toning, and a small pencil notation to top left. Accompanied by an original stereoview portrait of Sears seated at his desk. Publishing the first Sears Roebuck mail order catalog in 1888, R. W. Sears helped change the direction of the worldwide marketplace by offering individuals a wide variety of products at reasonable prices and delivering those items directly to them. This gave consumers a new, convenient way to shop, and was the precursor to the electronic commerce that dominates the world today. This document is the firm’s annual contract with Maine Central Railroad Company for the delivery services that made their entire wide-reaching business possible. An important document in the operation of Sears Roebuck, this piece holds the only Sears signature that we have ever seen…anywhere. An incredibly rare autograph from a key figure in the history of American business.